SANTA ROSA BEACH, Fla.-October 25, 2011–The 30A Songwriters Festival announces headline acts for the January 13-15, 2012 event including Indigo Girls, Rodney Crowell, The Bangles, Shawn Mullins, Sam Bush Band and Matthew Sweet. The third annual festival is produced by the Cultural Arts Alliance of Walton County (CAA), presented by Visit South Walton and sponsored by Seaside and 30A.com. The event brings together talented songwriters and musicians from around the country to perform in unique venues amid a backdrop of brilliant white sand beaches, turquoise waters and stunning architecture. The three-day festival will feature more than 125 musicians and over 250 performances in venues ranging from intimate listening rooms to spacious outdoor amphitheaters. Having quickly grown into one of the premier songwriters festivals in the country, the 30A Songwriters Festival attracts artists who represent many different genres. With styles ranging from folk, country, rock and alternative, the 2012 line-up features nationally-acclaimed songwriters and musicians including The Bangles, Rodney Crowell, Shawn Mullins, Matthew Sweet, Indigo Girls and Fastball as well as David Wilcox, Steve Forbert, Mary Gauthier, Sam Bush, Randall Bramblett, Tommy Talton, Jeffrey Steele, Chely Wright, Chuck Cannon, Corey Smith, David Olney, Davin McCoy, Lori McKenna, Tommy Womack, Kevn Kinney, The Shadowboxers, Larkin Poe, Emily Lynch, Joseph Arthur, Matthew Mayfield, Rachel Platten, Callaghan, David Berkeley, Garrison Starr, Jeff Black, Joe Leathers, Ben Glover, Billy Montana, Chas Sanford, Brian and Karyn White, Greg Barnhill, Forrest Williams Band, Kyle Jacobs, Kelsey Anna, Reed Waddle, Meg Huthchinson, Bridgette Demeyer, Daphne Willis, Shannon Whitworth, Suzi Ragsdale, Georgia, Ashleigh Flynn, Joanna Cotten and over 75 more. Festival venues span fifteen miles of gulf front highway and include Vue, Fire, The Naked Grape and the Gulf Place Amphitheatre in Santa Rosa Beach; First Note Music Hall in Blue Mountain Beach; Hibiscus, Pandora’s and Shorty’s in Grayton Beach; Fish Out of Water, The Gathering Spot and The Boathouse in WaterColor; The Lyceum, Bud & Alley’s, Pizza Bar, Central Square Records and the Seaside Meeting Hall Theatre in Seaside; La Botana in Seagrove; Caliza in Alys Beach; the amphitheater in Seacrest Beach; and Amavida, The Summer Kitchen and the Town Hall in Rosemary Beach. The 30A Songwriters Festival is produced by the Cultural Arts Alliance of Walton County and presented by Visit South Walton. Presenting sponsors are Seaside and 30A.com. Additional sponsors include ASCAP, Emerald Coast Wine & Spirits, Sowal.com, Gibson Guitars, Sweetwater Brewing Company, Nashville Lifestyles Magazine, Grayton Beer Company, Thirty-A Review, Atlanta’s Finest, JPB Commercial Real Estate Advisors, Birmingham Magazine, Atlanta Magazine and The Beachcomber. Premier lodging partners include WaterColor Inn & Resort, Cottage Rental Agency Seaside and Sunburst Beach Vacations, in addition to Beach Rentals of South Walton, Beach Seekers Vacation Rentals, Rosemary Beach Cottage Rental Company, 360 Blue Properties, Hibiscus Guest House, Dune Allen Realty Vacation Rentals, Ocean Reef Vacation Rentals and Rivard of South Walton. Proceeds from the 30A Songwriters Festival benefit the CAA and help fulfill its mission to support the arts in Walton County. For more information on the 2012 festival, including a full list of artists, venues, accommodations packages and how to purchase tickets, visit 30asongwritersfestival.com. To learn more about South Walton and Scenic Highway 30A, log on to visitsouthwalton.com, 30a.com. Go to : http://www.30asongwritersfestival.com/ to purchase advance tickets. 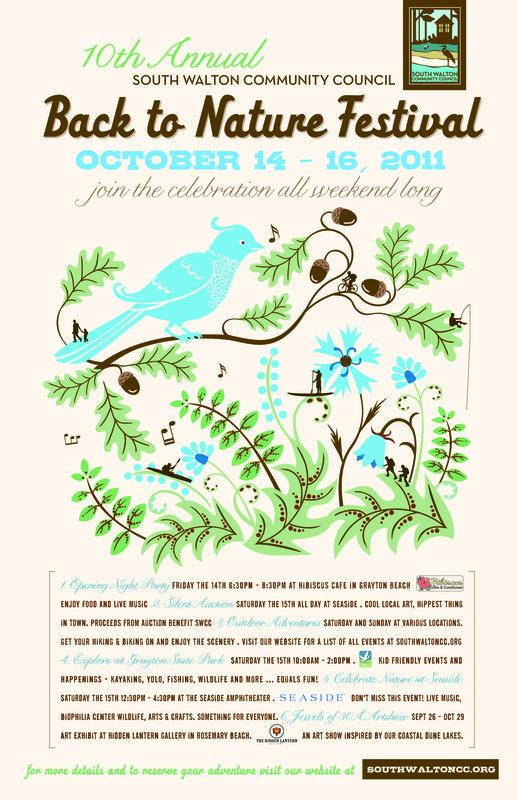 Friday October 14th kicks off the 10th Annual Back to Nature Festival presented by the South Walton Community Council. This is expected to be a fantastic weekend as always. Come out and celebrate the beauty of where we are all so fortunate to live. Opening Night Party Friday, Oct 14 @ Hibiscus Coffee & Guesthouse 6:30-8:30 pm. Live music of Chris Alvarado, food and fun! Join the party! Silent Auction Saturday, Oct 15th All Day @ the Seaside Amphitheater. Coolest Art, hippest things in town. Proceeds benefit SWCC. Outdoor Adventures Saturday & Sunday, Oct 15-16th throughout Walton County. Our classic adventures of hiking, biking, boating, kayaking, & riding. See our schedule and try something new or enjoy an old favorite! Explore at Grayton Beach State Park Saturday Oct 15th from 10 am-2 pm @ Grayton Beach State Park. This event will be hosted by Walton Outdoors & feature activities geared for kids 6 and up (must be accompanied by an adult). Activities will include fishing in the Gulf, kayak & YOLO boarding, sealife touch tank, Emerald Coast Wildlife Refuge’s rehabilitated wildlife exhibit, sand castle building and more, with plenty of giveaways for the kids. Sounds like family fun! Celebrate Nature at SeasideSaturday, Oct 15th 12:30-4:30 pm @ the Seaside Amphitheater. A celebration of nature & community, this event has something for everyone. As the music of Kyle LaMonica andElizabethtown plays, explore the E.O. Wilson Biophilia Center wildlife exhibits, green business displays, Farmer’s Market goodies, learn about local community groups & watch thekids get creative with arts & crafts. Bring your blanket or lawn chairs & join the celebration! Jewels of 30A Artshow Sept 26-Oct 29 @ The Hidden Lantern Gallery in Rosemary Beach. The artshow will feature art inspired by our globally rare & imperiled Coastal Dune Lakes. A portion of the proceeds will benefit SWCC. star of the week at Gigis in Rosemary Beach …. BRODY! because they can bite… he saw it on tv once. he does like monkeys though. but then he tried it and he did! for the TSUNAMI swim team. he is really fast at free style. his favorite food is BACON and BROWNIES. and the other one looks at fish bones. his favorite stinging insect is a WASP. but mosquitoes can take a hike. on his mom’s blog… right here!